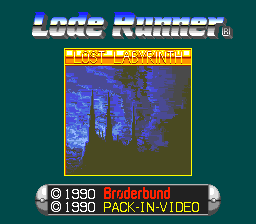 Lode Runner - Lost Labyrinth © 1990 Pack-In-Video Company, Limited. 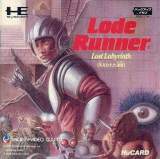 Lode Runner Lost Labyrinth is the PC Engine's conversion of Brøderbund's classic Lode Runner. The player assumes control of a small character in a spacesuit, and the goal of the game is to collect all the gold stolen by the malicious Bungeling Empire. As expected, an army of killer robots and other weird aliens mercilessly track down the player and try to catch him before he succeeds in collecting the loot. Although the lode runner is equipped with a laser-gun, the weapon is not used to blast enemies but to melt down blocks. The core of the gameplay lies in digging up holes and trapping enemies in them (holes even collapse and fill in after a while, killing anyone trapped in them). The game includes many other features such as ladders, fake or indestructible blocks, ropes and so fort... some stages do not even have robots wondering around, and the player has instead to figure out how to collect all the gold without getting himself trapped. When all the gold is gathered, an escape ladder appears and leads to the next area. The game consists of fifty stages, and each level can be accessed using a simple password, and the backup Ram can also be used to save the player's progress. Just like with the original game, Lode Runner Lost Labyrinth also features a level editor. Released on July 24, 1990 in Japan for 5800 Yen.